It is going to be “unbearable”! This winter I have pledged to be #FreezinForAReason as part of the 2019 Law Enforcement Torch Run Polar Plunge to benefit Special Olympics Illinois. That is right! I will be jumping into frigid waters in the middle of winter to benefit the more than 23,000 athletes participating with Special Olympics Illinois! While I’m getting cold just thinking about it, I’m excited to join the thousands of warm-hearted individuals that will participate in the Polar Plunge. To jump into the frigid waters, I have set a personal fundraising goal and I need your help to reach it! Any amount is appreciated – it all goes to one “cool” cause and gets me that much closer to my icy dip. Best of all, your donation helps provide athletes with intellectual disabilities the opportunity to participate in Special Olympics programs and reveal their inner champion. Donating through this site is simple, fast, and secure. It is also the most efficient way to make a contribution to my Polar Plunge efforts and show your support for Special Olympics Illinois. 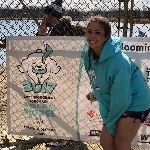 If you would like to join me or learn more about Plunge Illinois visit www.plungeillinois.com for all of the chilly details. Thanks in advance for your support – and don't forget to forward this to anyone who you think might want to donate too!